Formed in San Jose, CA and adopting their name from a 1998 Chinese film, glitchy art-pop outfit Xiu Xiu are self-reflexive and darkly charismatic frontman Jamie Stewart (vocals, guitar) and collaborator Angela Seo (pianos, synths, and drum programming). Stewart, veteran of the Bay-area underground, has become one of indie rock’s most reliable source of autobiographical despair– a coughing fit of uncomfortable on-the-edge-of-tears vocals, and overtly-chirpy electronic lazer blasts. 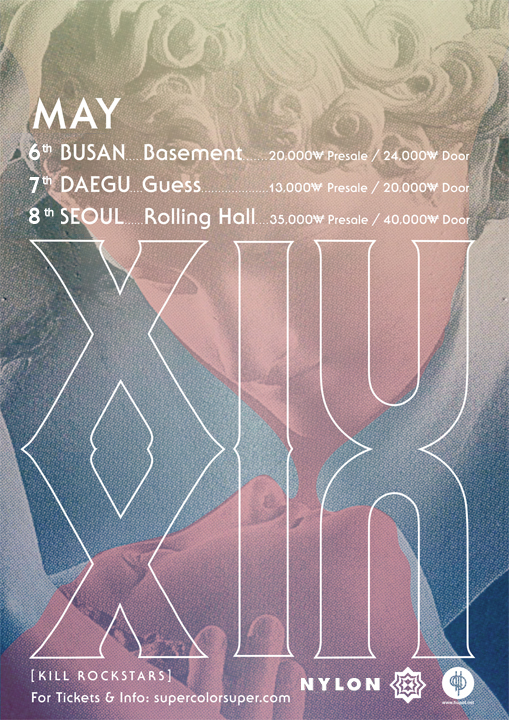 Although the band is keen on drawing heavy influences from an amalgam of disparate genres including punk, noise, ambient, folk, and chiptunes, Xiu Xiu has long evaded any attempts to cede to any narrow classifications or sonic format. Stewart is perhaps most recognized for his jarring and volatile lyrics which always emerge as some of the most intimate scripts to drape audiences alongside the accompaniment of deformed electro tapestries. The majority of songs deal with morose topics such as suicide, AIDS, war, and other overtly taboo experiences where they lurk beneath an intense facade of cacophonous percussion alongside lush hooks and diverging lyrical styles. Label mates to an impressively eclectic roster including Elliott Smith, Deerhoof, Decembrists, and Marie Stern, Xiu Xiu releases their seventh full-length album Dear God, I Hate Myself via Kill Rock Stars. The album leans heavily on steamy synth-pop and gothic chiptunes with Stewart offering more lush hooks and demented lyrics swathed in atonal guitar and synth fuzz. Tracks like creaky ballad “Hyunhye’s Theme”, stands apart from run-of-the-mill, sweaty art-pop, as does the bleary strings of “Impossible Feeling”. A sense of ordered disturbance plays out in individual songs with snippets of blocky rock guitar airdropped into the soft contours of “Gray Death”. The title track is a chest-beater that repeatedly breaks down into everything from IDM blips to hip-hop scratches while rubbery-pulsed, “Chocolate Makes You Happy” seems to transform bar by bar– flurries of computer noise, broken bells, touch-tone synths and aching vocals are seamlessly woven alongside a traditional folk cover titled “Cumberland Gap”. Xiu Xiu‘s music has always featured constant cosmetic modification and despite the album’s tortured details, the seventh Xiu Xiu album may be the most playfully arranged and colorfully textured in the band’s catalog. Tripping down side roads of manically ping-ponging synths, sour countermelodies and churning shards of sonic debris, the only constant is Stewart, fearlessly riding his train as it slips the rails and crashes into the consciousness of his audience who are always left equally wide-eyed and drunk over the striking beauty of Xiu Xiu‘s eccentricities. Xiu Xiu는 1998작 중국영화로부터 이름을 따온 글리치 아트 팝 밴드로 캘리포니아 주 San Jose에서 결성되었다. 어두운 카리스마의 선구자 Jamie Stewart(vocals, guitar)와 Angela Seo (piano, synth, and drum programming) 두 멤버로 구성 되어있다. 샌프란시스코 항만 출신의 Stewart는 자전적인 우울과 절망감을 원천으로 하는 인디 록 감성의 대표주자로서, 뚜렷하고 쾌활한 일렉트로닉의경험을 전해준다. 펑크, 노이즈, 앰비언트, 포크나 칩튠과 같은 각기 다른 장르의 혼합물에서 묵직한 결과물을 이끌어 내는 것이 밴드의 주특기이지만, Xiu Xiu는 특정장르나 사운드 포맷으로 규정되는 것은 꺼려왔다. Stewart는 아마도 듣는 이들에게 친근하게 드리워지는 삐걱거리면서도 변덕스러운 가사와 그에 뒤따르는 전자 멜로디로 잘 알려져 있다. 노래의 중심인 자살, 에이즈, 전쟁, 터부시되는 경험과 같은 음울한 것들이 귀에 거슬리는 격렬한 사운드 프레임의 퍼커션과 가사로 드러난다. Elliott Smith, Deerhoof, Decembrists, Marie Stern가 소속되어 있는 Kill Rock Stars레이블에서 Xiu Xiu 일곱 번 째 스튜디오 전장 앨범 Dear God, I Hate Myself 발매되었다. 앨범은 아련한 신스팝과 고딕 풍의 칩튠, Stewart의 중독성 있는 광적인 가사와 무조적인 기타 선율, 거친 신쓰사운드가 넘친다. “Hyunhye’s Theme”와 같은 절름거리는 유니크한 발라드 트랙은 격렬한 아트 팝이며, “Impossible Feeling”에서는 흐릿한 현악 선율이 더해진다. 이성으로부터 이끌려 나온 혼돈과 장애의 정서는 육중한 기타사운으로 “잿빛죽음”이 되어 부드러운 포물선을 그리며 투하된다. 타이틀 트랙 , “Chocolate Makes You Happy”는 희미한 맥박의 비트가 진행되는 동안, 반복되는 IDM부터 힙합에 까지 아우르는 스타일의 전자음과 브레이크비트로 가슴을 두드린다. 흩날리는 디지털 노이즈와, 불길한 경적음, 터치 톤의 신쓰, 고통에 찬 목소리가 한데 어우러지는 것은 가히 전통 포크송인 “Cumberland Gap”을 떠올리게 한다. Xiu Xiu의 음악은 끊임없이 개선을 통해 변화해오고 있으며, 그 중에서도 이번 Xiu Xiu의 7번째 앨범은 가장 장난기 가득하며 밴드의 다채로운 색을 반영하고 있다. OH GOD I CAN’T BELIEVE IT!!!!!! !